We are a small 501 (C) (3) animal rescue and sanctuary in rural New Hampshire. We depend upon the generosity of folks for support of the animals we save. This yea,r more than ever, we really need help to feed the horses and dogs. My mother died and left me enough money to support the sanctuary for a couple of years, but two sisters stole the money because they want me to lose my home and the animals. Yes, this is a true story - very sad, but true. It is so disturbing that family would deliberately want to hurt family. So because of what happened to me, this year has been a very bad year for us. I make enough money to pay my mortgage, but not to pay the mortgage and feed the animals. So, I'm behind on a mortgage payment because I have been feeding the animals. This was a bad year for hay, which is a staple for horses. Normally, we use 4 bales a day at $5.00 a bale, or $1825 yearly, but this year the price increased by $2.00. We need another $2000 just for hay until next June. 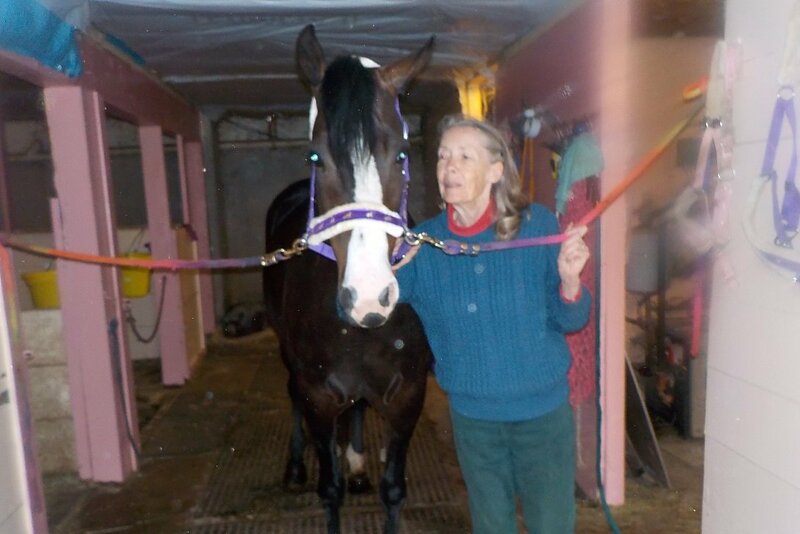 The picture of B, a 76- year old woman with Alzheimer's, who when she was a teenager, had a horse. We are using the rescued horses as therapy for her - she loves them and they love her. B is grooming Coco, a rescue from Massachusetts. It is so rewarding to see how B reacts to the horses and remembers them! Someday, I would like to offer animal therapy to other Alzheimer patients. Coco has a problem with her back legs. She was diagnosed with 'string halt' where her back legs will jerk. Her joints hurt her so I have to give her a supplement with turmeric in it to reduce the inflammation. In addition, I give her a daily dose of bute mixed with Pepto-Bismal because bute can be hard on the stomach. I tried MSM, but it doesn't work and when she gets uncomfortable, she bites at the railing in her stall. She's only 10 years old, and other than the 'string halt', she's in good condition. 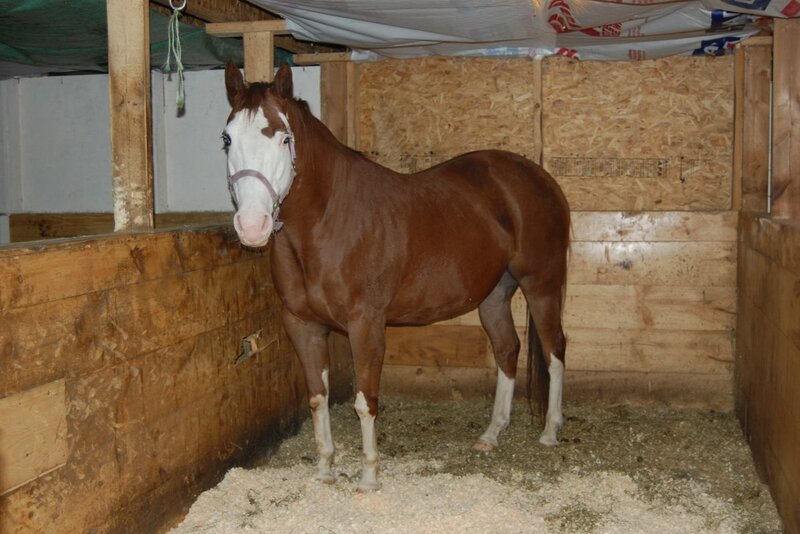 She is not ride-able because of her condition, but we don't ride, drive or breed any of the rescues. Our promise to them is that they will live out the rest of their lives in peace. Animals come here by word of mouth - someone knows someone who can't keep a horse, dog, or cat, and they call me. Coltan's owner, Tammy, died of cancer, and while she was sick, Coltan spent 24/7 outside without much food. Tammy's husband called me and asked me to take Coltan. I knew that Tammy would want that, so I paid to have Coltan shipped from Indiana to NH. He found is forever home. Coltan has bad arthritis in his back legs, so he's on a supplement with turmeric in it for swelling. Horses left outside in bad weather don't toughen-up! On the contrary, bad weather stresses animals and compromises their immune system. PLEASE help us save the animals. All monies will be used for food for the rescues - dogs and horses - so that the money I have will pay my mortgage. If 300 people donated $10.00, we could almost reach our goal. Remember: your donation is tax deductible. Bless you all for helping save the animals. My dear friend, Kendahl, a pot bellied pig passed on. 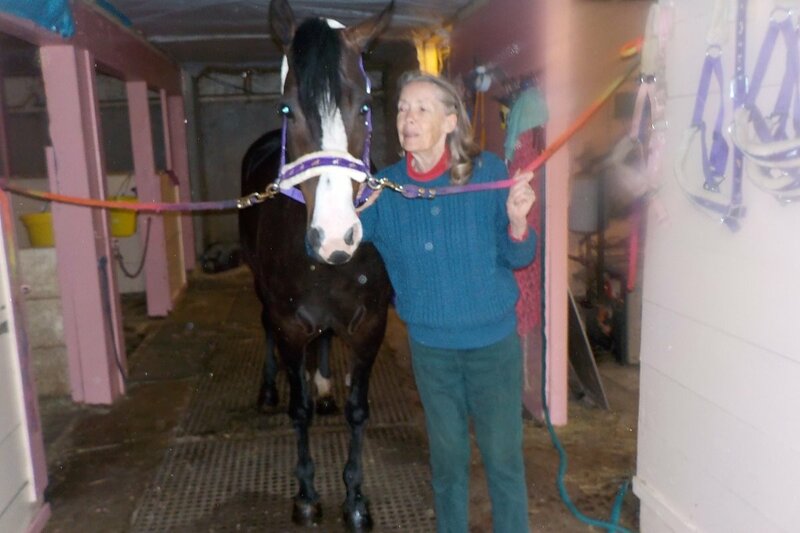 I contacted the woman from whom I rescued Kendahl and told her of Kendahl's passing. Kendahl's former owner told me of a woman who needs to rehome 2 pot bellied pigs, Stella and Penny. I am so amazed at the synchronicity of life. Kendahl's passing made room for Stella and Penny. On Sunday, February 10th, I will be picking up Stella and Penny and bringing them to their forever home. I will take pictures and post them on line. I have been advised that when they are nervous, they poop a lot. The night before Kendahl passed on, I wrapped her in a yellow fleece blanket and this is how I found her in the morning. 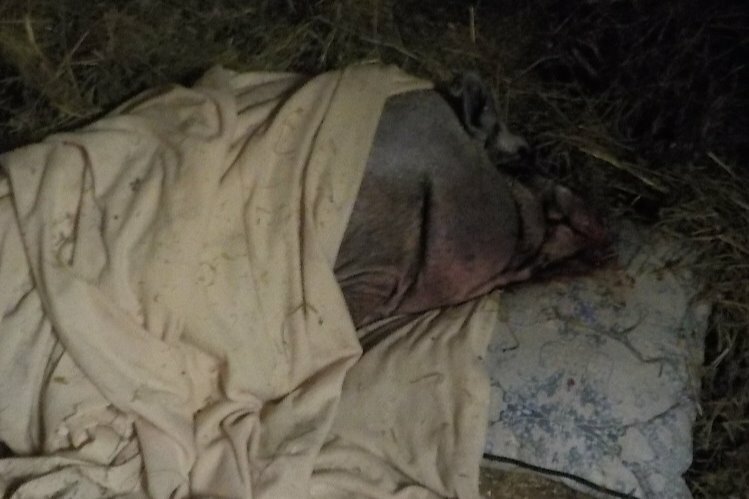 She had an area of hay and shavings, but boy did she love blankets. Bless you Kendahl. I miss you honey. I do want to thank you for your donations and kindness. But, we still need help with hay. Please pass this along to your friends. The horses will love you! Something to think about: whenever I rescue a dog without vet paperwork, immediately I take the dog to my vet for a check-up. Holly's check-up included a rabies and a distemper shot along with two tests, one for worms and the other for a urinary tract infection. When the tests were negative, we made an appointment to have Holly spayed. The total spent on Holly is $538, and unfortunately, the local vets don't give 501(C)(3)'s a discount. Donations enable me to help more animals. The other day I received a call from a woman in CT who is moving. She asked me to rescue her 8-year old English Bull Dog who eats her poop! The woman said if I didn't take her dog that she would euthanize it. The calls to rescue animals come from word-of-mouth.....someone knows someone who knows me. A few people around here think its time I learned to say NO. But, I consider myself a spiritual person and spiritual people don't turn their backs on people and animals in need of help. How can they argue with that? I'm a firm believer that people and animals come into our lives for a reason; for a season; or for a lifetime. My heartfelt thanks to those of you who came into my life so that I could help the animals I have rescued. 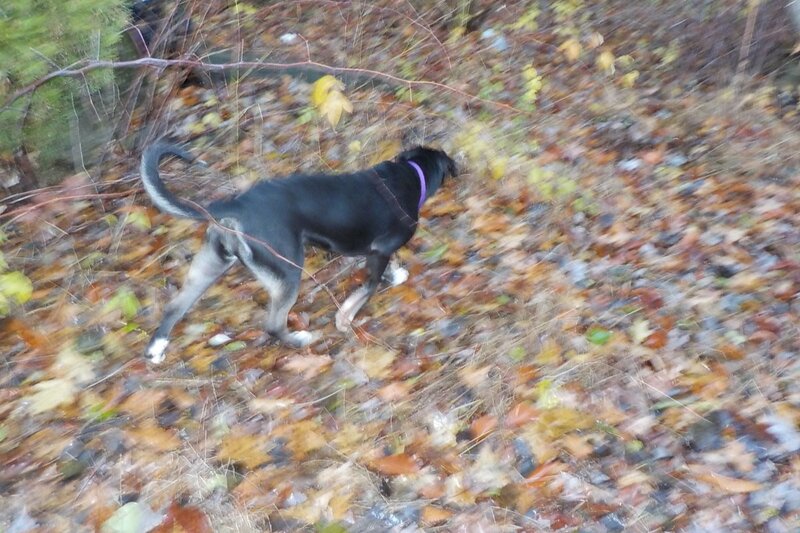 Introducing Holly, a 6-month old Lab cross, who arrived at my house 6 weeks ago. A well-intentioned neighbor rescued Holly, and much to her dismay, soon discovered that Holly was house-broken. Holly wasn't crate-trained either and had an anxiety issue. After two days of Holly peeing and pooping on her carpets, the neighbor arrived at my door and said: "you're a rescue, take her". And, she didn't tell me that Holly wasn't house-broken until I asked her. Holly had no structure in her life, so it was important to get her on a routine as soon as possible. Because she had a separation anxiety issue, the vet decided to prescribe a mood elevator, and that is working well. Holly is now crate-trained, and when tired, will go into her crate for a snooze. She has lapses of memory and will leave a puddle or poop by the door, but she has made lots of progress. Structure, consistency and patience are key to helping rescues adjust to a new life. Like people, animals have feelings and know when they are not wanted. Yes, animals have abandonment issues, just like humans.